Psoriasis Drugs Market : Segmentation By Product Type - topical psoriasis drug, oral psoriasis drug and injectable psoriasis drug, Psoriasis Treatment Products; By Drug Class - Corticosteroids, Anti-inflammatory, Interleukin Inhibitors, Tumor Necrosis Factor Inhibitors; By Disease Indication - Plaque psoriasis, Guttate psoriasis,Inverse psoriasis,Pustular psoriasis and Erythrodermic psoriasis. A recent market study published by the company – “Psoriasis Drug Treatment Market: Global Industry Analysis 2013-2017 & Forecast 2018-2028” consists a comprehensive assessment of the most important market dynamics. On conducting a thorough research on the historic as well as current growth parameters of the Psoriasis Drug Treatment market, growth prospects of the market are obtained with maximum precision. The report features unique and salient factors that may make a huge impact on the development of the Psoriasis Drug Treatment market during the forecast period. 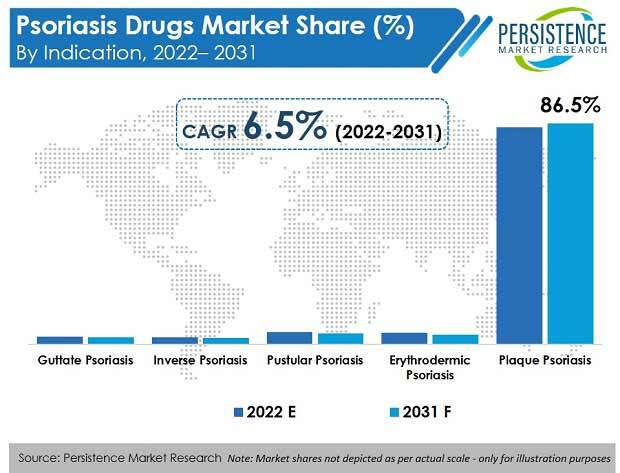 It can help market players to modify their manufacturing and marketing strategies to envisage maximum growth in the Psoriasis Drug Treatment market in the upcoming years. The report provides detailed information about the current and future growth prospects of the Psoriasis Drug Treatment market in the most comprehensive way for the better understanding of readers. The growth of the psoriasis drugs market is due to rising prevalence of psoriasis, which has increased the usage of various psoriatic pharmaceutical products and treatments across the globe. According to the WHO, the prevalence of psoriasis ranges between 0.09% and 11.43% globally, making psoriasis a serious global problem with at least 100 million individuals affected worldwide. It has also reported that the prevalence is high in Caucasians compared to other ethnic groups, and is most common in cold north region than in the tropical region. In the future, cases of psoriasis are expected to grow by 14% globally. The cause of psoriasis is genetically linked and the first episode of psoriasis can also be triggered by environmental factors leading to increase in number of patients across the globe. The psoriasis drugs market is largely dominated by the key players who are competing on the basis of novel products in the psoriasis drugs market. Growing awareness regarding the treatment options of psoriasis have created growth opportunities for the players operating in the psoriasis drugs market. Examples of some of the key players operating in the psoriasis drugs market are Novartis International AG, Pfizer Inc., Merck & co., and Abb Vie Inc. These companies hold more than 35% revenue share in the global psoriasis drugs market. They are focusing on business expansion in developing regions or emerging Psoriasis Drugs markets. The growing competition between the leading players in the psoriasis drugs market is due to the efforts of developing most efficacious drugs, which has led these companies to hold large share in the global psoriasis drugs market. Psoriasis is a chronic inflammatory skin disease associated with wide co-morbidities such as diabetes and psoriasis arthritis. Wide variation in patient choices, combined with the complex patient psychology involved, continues to contribute to suboptimal treatment. Psoriatic treatment is continuously evolving with the introduction of new treatments almost every year. Combination of various psoriasis drugs are used to treat patients, as the traditional single drug therapy has side effects. Several novel psoriasis drugs and advanced techniques have been introduced in the psoriasis drugs market, which is fueling the demand for combination therapies and consequently expected to boost the growth of the psoriasis drugs market. Owing to these factors a growth in revenue generation for the psoriasis drugs market has been registered. Psoriasis can develop at any stage and in any age group. Psoriasis not only manifests in physical form, but also impacts the patient’s mental health as it is a chronic condition which has a significant negative impact on the quality of life of those who suffering with the disease. Up to 32% of patients suffer from depression due to psoriasis. People with psoriasis often experience physiological problems such as low self-esteem, less coping responses, low self-esteem and also have feelings of shame, social stigma and embarrassment regarding their appearance. As a consequence, psoriasis is associated with having a debilitating effect on the quality of life of people suffering from it. Which creates immediate demand for psoriasis drugs. Psoriasis is an irritating skin disease that can cause discomfort and anxiety. Although psoriasis is not easy to cure, the treatment can provide relief during flare-ups. Patients opting for psoriasis management are increasingly adopting technologically advanced non-invasive or minimally invasive psoriasis treatment procedures for achieving quicker and effective results in a short time. To address this issue manufacturers are developing new biological drugs with the help of biotechnology, which will be effective for long term. These biological treatments are an alternative to conventional psoriasis drugs treatment for moderate and severe psoriasis. Emergence of biosimilar is also a trend that is being increasingly adopted by the key players operating in the psoriasis drugs market, thereby driving the psoriasis drugs market growth over the forecast period. The competition section of psoriasis drugs market report features profiles of the players operating in psoriasis drugs market based on their market shares, differential strategies, psoriasis drugs product offerings, psoriasis drugs marketing approach and company dashboard. Examples of some of the key players featured in psoriasis drugs market report include Merck & Co., Abb Vie Inc., Amgen Inc., Eli Lilly & company, Sun Pharmaceutical Industries Ltd, Novartis International AG, Janssen Biotech Inc., Pfizer Inc., and Boehringer Ingelheim GmbH, among others. Novartis International AG offers a range of products for psoriasis treatment, which include Cosentyx, Neoral, and Ilaris. Cosyntex an innovative product contributed major revenue share of the company and was reported to have made US$ 2071 Mn in 2018. The key manufacturers of psoriasis drugs are focusing on novel marketing strategies to increase product penetration. The companies in psoriasis drugs market continue to view acquisitions as a major part of their growth strategy in psoriasis drugs market. The companies are also focusing on to build a value chain for their focus areas, innovate new products in psoriasis drugs, and develop sustainable solutions. Psoriasis is a chronic inflammatory skin disorder, the disease is caused due to genetic disposition and other environmental factors. The immune system plays an important role in development of psoriasis. It fastens the life cycle of skin cells. In psoriasis cells tends to build rapidly on the surface of the skin. The extra dermal cells form scales and red patches, which are itchy and cause burning sensation. Plaque psoriasis is the most common form of psoriasis. Psoriasis drugs comprise topical creams, oral treatments, and injectable. The company conducted a research study on psoriasis drugs market for the forecast period of 2018 to 2028. The report offers a comprehensive evaluation of the business opportunities prevailing in the psoriasis drugs market along with insights on various psoriasis treatments, consumption trend, disease incidences, and awareness level for psoriasis and psoriasis drugs. The report elaborates the macroeconomic factors influencing the dynamics of the psoriasis drugs market and its futuristic potential. The report offers a comprehensive taxonomy of the psoriasis drugs market based on product type, drug class, disease indication, distribution channel and region. Based on geography, the psoriasis drugs market has been segmented into seven regions, namely North America, Latin America, Europe, CIS & Russia, Japan, Asia-Pacific Excluding China and Japan (APECJ), and the Middle East & Africa (MEA). The psoriasis drugs market is segmented by product type into topical, oral and injectable. The market has been segmented by drug class into interleukin inhibitors, corticosteroids, anti-inflammatory and tumor necrosis factor inhibitor. By distribution channel, the market has been segmented into hospital pharmacies, retail pharmacies, and e-commerce. What is the revenue potential of point of care psoriasis drugs across regions of North America and Europe? Who are the key competitors in psoriasis drugs market and what are their portfolios in psoriasis drugs market? What are major challenges influencing the growth of psoriasis drugs market? What are the different reimbursement scenarios for psoriasis drugs? The process of market research followed at the company commences with extensive secondary research of the psoriasis drugs market. We have obtained industry-validated, historic and current data about the demand and sale of psoriasis drugs. The comprehensive secondary research was followed by primary research on psoriasis drugs. Detailed information about the psoriasis drugs market was obtained, in terms of value (US$ million) and number of procedures. Based on thorough secondary and primary research of growth parameters of the psoriasis drugs market, we have come up with the most precise forecast on how the psoriasis drugs market will grow during the forecast period.